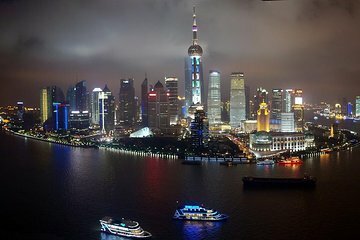 Embark on a Huangpu River cruise and take in panoramic views of Shanghai in comfort on this private night tour that includes VIP cruise seating. Before and after the cruise, the tour also takes you to explore the distinctive architecture, shops, and tea houses of Shanghai Old Town and for a stroll down Nanjing Road. Excellent tour. Our guide was was very good and informative and the cruise was a great experience including the crush to get on board but access to the VIP area, slightly removed from the crowds, made it very pleasant with great views of the Shanghai water front at night. The city tour also very good and atmospheric - defiantly recommend it.